All the bits have been falling into place for months, and come together here. 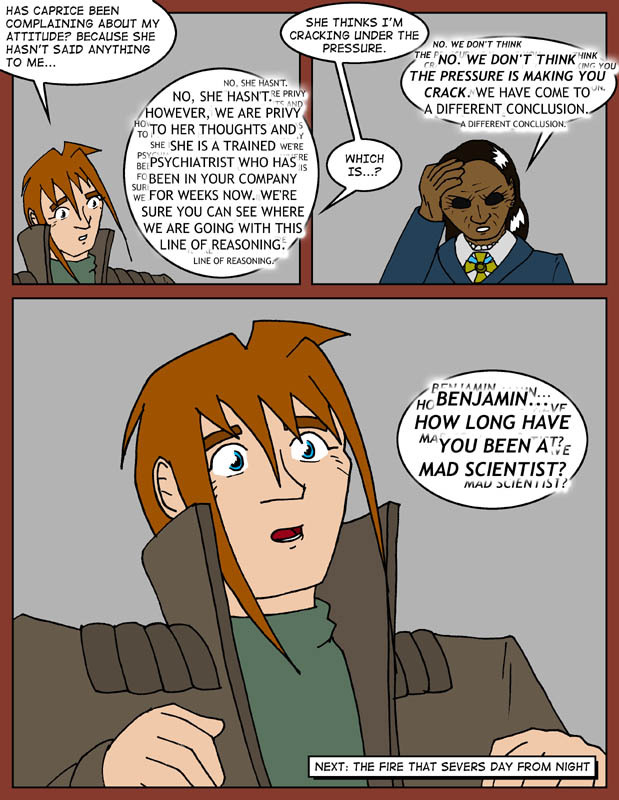 All those who guessed that Benjamin is a mad scientist get gold stars. Important lesson: If you have a secret to hide, and it has to do with your psychological makeup, don't spend several weeks in the company of a superintelligent psychiatrist. Here endeth Chapter Three. Chapter Four starts on Monday with revelations about Benjamin's past! Woo! I'm all tingly. Or maybe that's the caffeine. Well, to be fair, it'll start with a title page, then the big ol' revelations and whatnot. Hmm, then again, the title page itself will contain something of a pretty big revelation. As a side note, we will not be taking a break in between chapters like usual; we'll just be getting straight to business. You folks have waited long enough for this fourth (and final!) chapter, I think.